Regency at Damonte Ranch is a beautiful new active adult community in Reno, Nevada. This gated 55+ neighborhood has 650 single-family homes developed with the active adult in mind and boasts desirable features like single-story living, private outdoor spaces, and gourmet kitchens. The clubhouse has all the amenities needed to keep residents physically active and socially fulfilled. 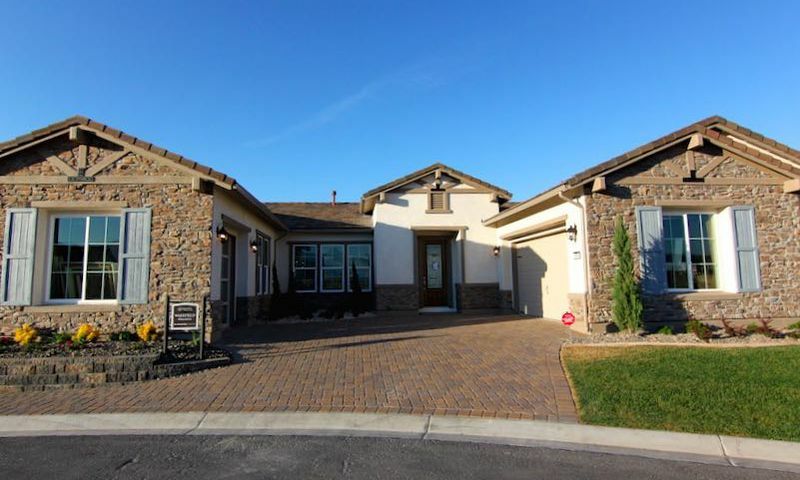 Located within the Damonte Ranch master-planned community in Reno, Nevada, Regency at Damonte Ranch provides proximity to all the attractions that 55+ homebuyers desire. At the center of the community is a 18,000 square-foot clubhouse. Here, homeowners will find an indoor pool and spa, fitness center, and aerobics and dance studio, ensuring residents will have several ways to stay fit. A game room, billiards tables and comfortable lounge allow residents to stay socially active. Outdoors, there are tennis, pickleball and bocce ball courts, while walking and biking trails weave throughout the community. In addition to the clubhouse, residents will have full access to amenities at Presidio at Damonte Ranch, an all-ages community. This clubhouse boasts a recreation center for physical well-being. Outdoors, there is be an outdoor pool, patio, walking trails, and a playground for when the grandkids come visit. This 55+ community offers homeowners nine single-family floor plans from three collections. The Tamarack Collection has three single-family home models that range in size from 1,660 to 1,784 square feet with two bedrooms, two bathrooms, and an attached two-car garage. These lovely homes feature gourmet kitchens, spacious great rooms, and covered patios. The Winterlake Collection homes range in size from 1,991 to 2,223 square feet and offer two bedrooms, two or two-and-a-half bathrooms, and an attached two-car garage. These homes feature secluded dens perfect for a home office and spacious master suites. The Woodridge Collection homes range in size from 2,192 to 2,411 square feet with two bedrooms, two-and-a-half bathrooms, and an attached two or three-car garage. With flex spaces, single-story living, and beautiful outdoor spaces, the Woodridge Collection offers active adults perfect homes that cater to their needs. This 55+ community provides homeowners with several ways to stay active while building a close-knit community of like-minded residents. Social gatherings will abound with billiards and card tournaments, Friday night cocktail parties, and the dinner club. Give back to the community with philanthropy events and keep your mind sharp with continuous learning. Perfect your swing with golf outings while enjoying the company of neighbors. Life at Regency at Damonte Ranch means enjoying carefree living with an active social life. Regency at Damonte Ranch is located in Reno, Nevada. Just around the corner from the community's gates are several shops along Steamboat Parkway including a CVS, banks, restaurants, and a Walmart Supercenter. Huffaker Park, which features luscious green space and miles of walking trails, is just a short drive away. Downtown Reno, featuring a host of terrific restaurants, shopping, casinos, and bustling arts district, is just twelve miles away. This active adult community is conveniently located just a few miles from hospitals, the Reno-Tahoe International Airport, and several golf courses. For the dedicated golfer, the Edgewood Tahoe Golf Course, named the best course in the area by GolfAdvisor, is about an hour away. Regency at Damonte Ranch has everything you want in an active adult community in Western Nevada. Residents at Regency at Damonte Ranch will also have access to the future clubhouse at the neighboring Presidio at Damonte Ranch. There are plenty of activities available in Regency at Damonte Ranch. Here is a sample of some of the clubs, activities and classes offered here. The Tamarack Collection has three single-family home models that range in size from 1,660 to 1,784 square feet with two bedrooms, two bathrooms, and an attached two-car garage. These lovely homes feature gourmet kitchens, spacious great rooms, and covered patios. Please Note: Floor plans are not available at this time. There are three home models in the Winterlake Collection. These homes range in size from 1,991 to 2,223 square feet and offer two bedrooms, two or two-and-a-half bathrooms, and an attached two-car garage. These homes feature secluded dens perfect for a home office and spacious master suites. Please Note: Floor plans are not available at this time. The Woodridge Collection has three home models to select from and range in size from 2,192 to 2,411 square feet with two bedrooms, two-and-a-half bathrooms, and an attached two or three-car garage. With flex spaces, single-story living, and beautiful outdoor spaces, the Woodridge Collection offers active adults perfect homes that cater to their needs. Please Note: Floor plans are not available at this time. The Presido Collection consists of three floor plans. They range from 2,495 to 2,873 square feet in size and have three to six bedrooms, two to four bathrooms, and attached two, two-and-a-half, or three-car garages. Absolutely the most beautiful, high-end model homes I’ve ever seen, and I used to sell very expensive new homes (not retirement communities though). Looks like a great area too, and Toll Brothers builds a fine home. The only negative is you aren’t getting anything close to what you see in the models, which makes it hard to tell what you’re actually buying for more than a half million. Even the floor plan you get will likely be very different as they offered quite a few options in terms of garages, den/3rd bedroom, kitchen (smaller island versus humongous in model home), etc. Models are expected to be well over a million $$ when they go on sale later this year, according to the sales associate. HOA dues almost $300/month includes upkeep of front yard landscaping. 55places.com is not affiliated with the developer(s) or homeowners association of Regency at Damonte Ranch. The information you submit is distributed to a 55places.com Partner Agent, who is a licensed real estate agent. The information regarding Regency at Damonte Ranch has not been verified or approved by the developer or homeowners association. Please verify all information prior to purchasing. 55places.com is not responsible for any errors regarding the information displayed on this website.